I don’t usually try to cover all of European soccer stadium news, both because there’s so much of it and because the stadium swindles that typify North American sports are largely unheard of there, for varied reasons having to do with government attitudes toward corporate subsidies, team ownership structure, and the way the leagues themselves are organized. (Real oversimplified version: It’s hard to shake down your city for stadium money by threatening to leave if your city can just start a new minor-league team and have it play its way up to the majors in a few seasons.) But I’m going to make an exception for F.C. Barcelona‘s $711 million stadium expansion plans, not just because we’re a Barça household here, but also it reveals some interesting things about how stadium finance works these days. Aside from providing exciting new ways for Barça fans to fall to their deaths, apparently, that’s a whole lot of room for new places to sell stuff to fans. And indeed, a “new zone of restaurants” is one of the things the club has planned as a revenue generator for the redone space, as well as doubling the number of VIP seats to almost 8,000, and selling “partial” naming rights to the building, which probably means something like MetLife Stadium’s corporate sponsored entrances, though without the corporate stadium name since that wouldn’t fly well with Barça fans. It’s all a lot like the $1 billion in upgrades that the owners of the New York Knicks and Rangers undertook to Madison Square Garden a few years back: A fabulously wealthy franchise spending a bunch of money in the hopes of making more money in the future. The parallel even goes as far as F.C. Barcelona (along with three other Spanish clubs) getting special tax breaks like MSG, something the European Union keeps threatening to rule on the legality of — though also like MSG, they get the tax breaks regardless of what they spend on stadium upgrades, so this expansion really is coming out of the team’s own pocket, even if that pocket has been previously bulged a bit with cash at public expense. The other difference, of course, is that those Barça fans are the team’s owners — it’s that ownership structure, in fact, that is getting them (plus Real Madrid, Athletic Bilbao, and Osasuna, who despite the extra cash are mired down in the second division) the special tax treatment. And the fan-owners actually voted on the Camp Nou renovation (vs. another proposal of building a whole new stadium), so arguably you could say that this is an example of fans just wanting a snazzier place to watch the game (and buy things), and tapping the team’s deep pockets to pay for it. So what does this — along with other new team-funded stadiums like Chelsea‘s, which recently got the ultimate in vaportecture videos, a series of renderings created by a season ticket holder who responded to a team request for design proposals — say about how stadiums should be built, renovated, and funded in North America? That if you’re popular enough, obviously, there are certain cases where spending hundreds of millions of dollars in team money on upgrades can make sense, both financially and (one hopes, if the Barça voters were smart) in terms of actual fan enjoyment. For the vast majority of teams, though, in a saner world it would be more about smaller, incremental upgrades as the fan base grows — like, for example, the expansion that newly first-division Eibar is undertaking to expand its teeny 6,000-seat stadium (better photos here). 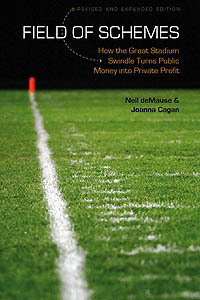 That’s also pretty much how the U.S. stadium and arena world worked for the first half of the 20th century, before the threat of moving teams and mayors who thought their job was to throw “development incentives” at private companies and professional economic impact studies changed the world and made it necessary for Joanna Cagan and I to write a book and start this website. We might get back there again someday, maybe, but in the meantime I think I’ll be renewing the fieldofschemes.com domain name just the same. European soccer remains generally outside the scope of this site, but I think I can make an exception for freakin’ F.C. Barcelona, which has announced it will conduct a major remodeling of its historic Camp Nou stadium rather than replacing it. 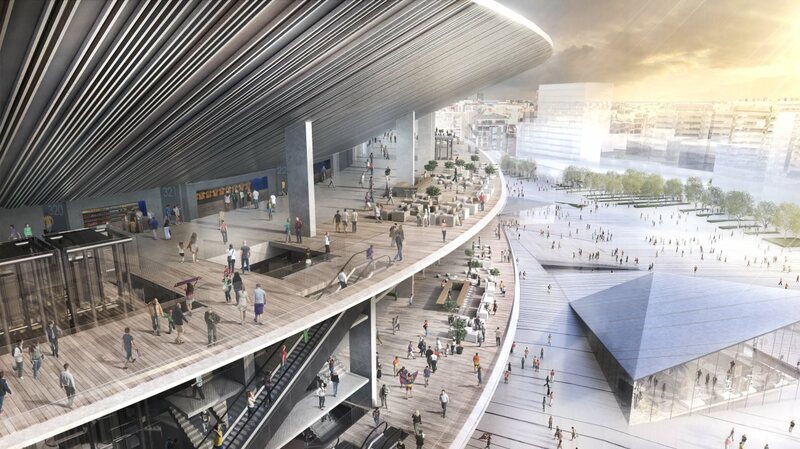 The cost will be about $800 million, will run from 2017 through 2021 while the team still plays there, and will include added seating, new restaurants, and a new roof. “The option of building a new stadium on a new site has been rejected as the final cost could have saddled the club and its members with debt and tied the hands of future boards of directors,” added Rosell. That’s eminently logical, and of course not at all the way we do things here, where fears of saddling teams with debt are typically used as a reason to demand public subsidies, not to scale back costs. In other we’re-not-in-Kansas news, the Camp Nou remodeling will be voted on by Barcelona’s 222,000 members, since these fans are effectively shareholders in the team. I can’t even imagine what this system would look like if it were implemented here, since as we all know, voting on things is un-American.